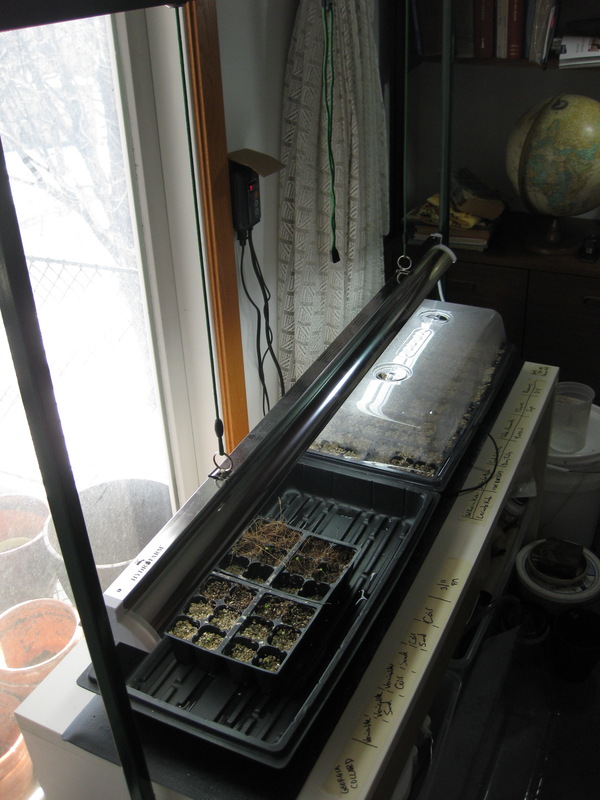 It’s still snowing and below freezing here in zone 4b, south central Minnesota, but it’s definitely time to get on the ball planning for the full exposure growing season! We’ll be doing two main gardens, one at a relative’s house in Hastings (800+ sq ft) and another at our community garden plot in Saint Paul (300 sq ft – just got our confirmation Wednesday!) I may also try a few things on our balcony, which is mostly shaded except for one corner which sees full sun – I’m thinking mostly greens/herbs and maybe a cucumber in a wine barrel or grow bag. We’ve got seeds! I went into the season with a ton of saved tomato and herb seeds, and not much else, so I spent some time and hard earned cash over at the Seed Savers Exchange website getting some serious edibles and companion plants. We’ll be doing a couple of “three sisters” style plots this year, as well as a ton of brassicas, tomatoes, cucumbers, herbs, and other greens. 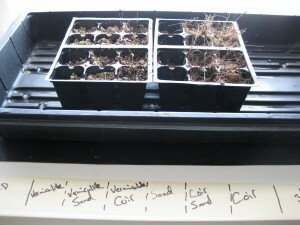 I decided to play around with some different seed starting media, rather than buying a mix. 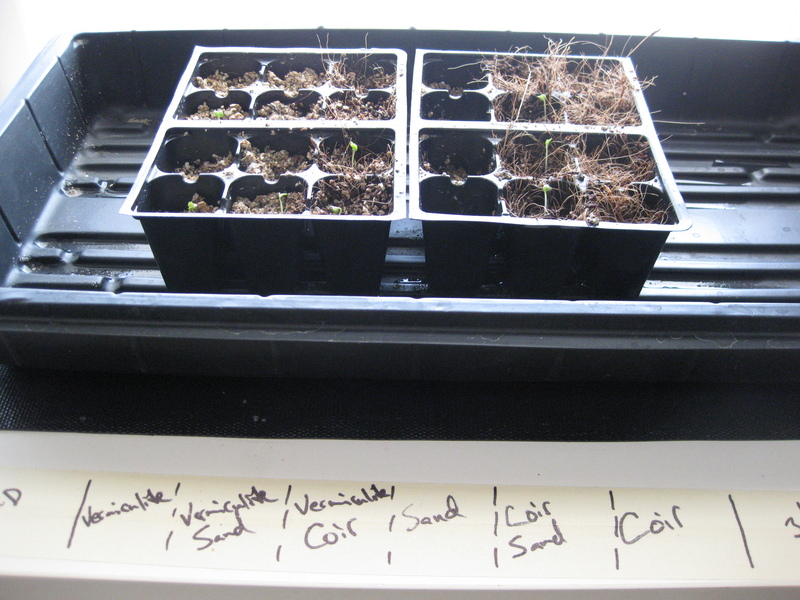 I started out with way too much moisture in all the mixes, so I had some mold early on (these seedlings were started just under 3 days ago), but they seem to be doing better now. I decided to start in a mix of 100% vermiculite and then up pot to an organic potting soil mixed with vermiculite and coconut coir once the true leaves start to come in. I set up a starting station with a Super Sprouter 2 Tray seedling heat mat, a Hydrofarm Jump Start 64W T5HO single bulb fixture, and a Hydrofarm Digital Thermostat to keep the temperature under control and consistent. With just over $100 invested and the capacity to start 140 seeds at a time, I feel like I will be saving about that much by not buying starts this year alone, as well as the added benefit of having starts to give away to friends! This also lets me grow what I want to, not just what is available at the local nurseries. 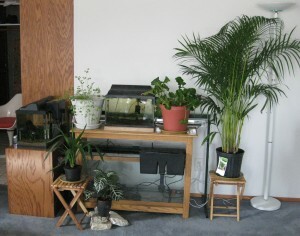 In the meantime I got our living space rearranged a bit with the goal in mind of setting up my initial aquaponics “tester”. I will be using a 30 gallon all glass aquarium on the bottom shelf of its stand with a 50 gallon rubbermaid HDPE tote from a local home improvement store (under $20.) On order is a 300 gph (gallon per hour) water pump, necessary to lift the water nearly 4 feet up into the grow bed. I’ll be growing in expanded clay pellets purchased from my local hydroponics store – this was the pricy bit at just over $30 per 50lb bag, but it is inert and reusable for future projects. 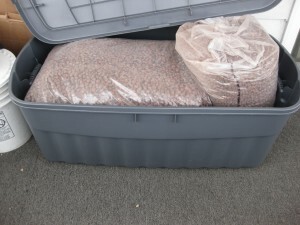 The advantage of this is that it will be very easy to move plants around without damaging them, and it is much lighter weight than the equivalent of gravel/pebbles. It should also be significantly cleaner than any of the cheaper options, saving me some work up front. After the pump arrives I will start assembling plumbing hardware, including a ball valve to limit the flow of water. I will also start building my bell siphon, which will eliminate the need for a pump timer in my flood and drain system. I will also be purchasing a 4-bulb shop light fitted with full spectrum fluorescent tubes (4′ length) and hooking up some sort of pulley system above the grow bed – possibly ceiling mounted. If you’re interested in seeing what some other folks are doing on a similar scale, both PhillyAquaponics and ImpossibleFrontflip over on YouTube have a great series of videos on the subject – it is really incredible how many people out there are playing around with this idea, on a wide range of scales. There are also some great discussions to read over at Backyard Aquaponics, and the crazy awesome folks over at Permies even have an aquaponic forum. Also on my mind have been wicking beds – a pretty ingenious way to have a low maintenance garden and even use your aquaponics/aquarium water to feed more plants. 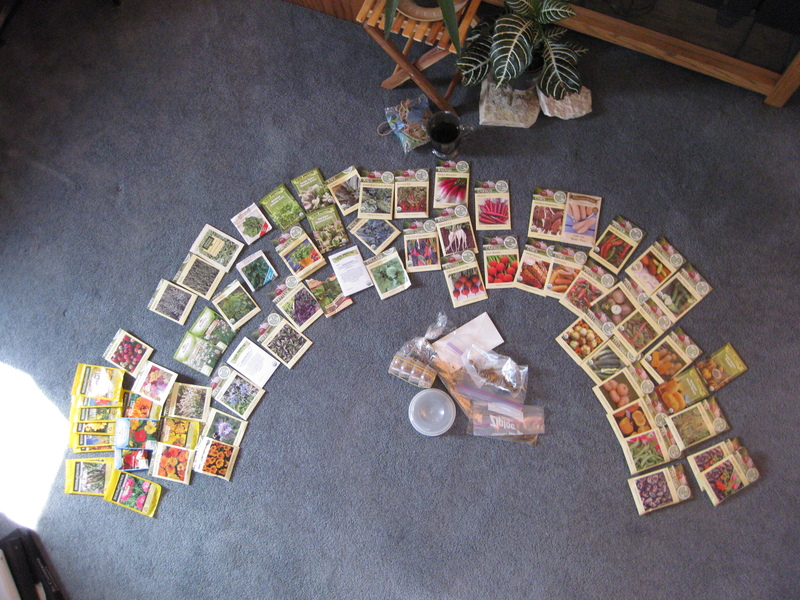 And finally, I had a good time playing around with Garden Planner Online, a really easy (and free to try) piece of software to design your garden by the square foot or square inch (or square meter, etc) – it even lets you print your garden plans to pdf so you can save and look them over later. Good luck with your spring planning! This entry was posted in Misc by k lund. Bookmark the permalink.